the show was billed as "Gods of War 12" and was mixed MMA / boxing. Papadopooulos ended matters with a bodypunch. Linardatou won the vacant WBO female 140 lb title. Wyatt was floored three times in the sixth and it was stopped. (vacant IBF Mediterranean Super-Featherweight Title). Encarnacion announced his retirement afterwards. Liihaug won the vacant IBA I/C and WBO Euro titles on scores of 96-94 twice and 97-93 but Laine had him hurt in round nine and it could have gone the other way. Kozin won the vacant WBFed 168 lb title on scores of 98-92, 99-92 and 97-93. GBU interim 175 lb title. Forsman came in on a week´s notice and did all right but is on a big losing trend. GBF Euro 175 lb title with Schmidt down from cruiser and Joensuu up from middleweight. Joensuu - about 8-10 kg lighter than his opponent - was floored by a right and his legs betrayed him. It looked bad as his legs just wouldn´t listen and he couldn´t get up as the referee waved it over. Birkenbergs was a same day sub and was down in the fourth. Kuvac was down in the first and tree times in the second of a mismatch. Kebbeh was too eager and is pretty green and that prolonged the fight. Siska fell over twice, more tired than hurt. Matic, well, he tripped on his legs as he tried to escape and it had to be stopped. Chakvashvili down from bodyshots in both the second and third in a big mismatch. Aduashvili was down late in the third. Kuca was down once in the first and twice in the second and tried to make a fight of it inept as he is. Ory retained the EBU 118 lb title on scores of 116-112 twice and 119-109. Rahkimov retained the IBO 126 lb title Maemu retired in his corner after being badly hurt and floored by bodyshots in the 4th.. He was also down in the fourth. 100-90, 99-91 and 98-92. IBF Int´l title. Chaiporn was down twice in the 8th. WBA Asia 130 lb title. 77-76 and 77-75 for Skavinskiy and 77-75 Toth. Neluvhalani was down in the first and again in the second. 80-72, 79-73 twice. Dipaen was down in the first. Khamatov was down three times in the first. 58-55 twice and 57-54. Gaipov had a point deducted in the 5th for hitting after break. Ouma was retired by his corner with nothing going on - as to why and why the retirement was accepted are open questions. 59-55 twice Matyja and a strange 59-56 Grafka. The championship of the Baleares at stake. Isava´s corner retired their man in the fourth. vacant EU 112 lb title. WBO Youth 160 lb title. WBC Med 130 lb title. di Bella stopped due to cuts. di Bella was a late sub for Luigi Leonardi. sm: Brandon Borg, Mal W 10 Rakhim Kasanov, ?? RBO I/C 175 lb title. vacant RBO I/C 147 lb title. 4x3, lh: Nikki Osim, Mal W dq 2 Jorge Ortiz, Col/? 100-90 on all cards. GBC female 130 lb title. 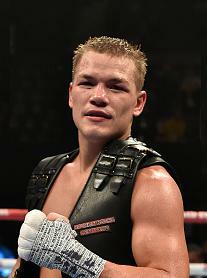 vacant GBA German Int´l 147 lb title. Eklund hurt but still standing when it was stopped. lh: Ricards Bolotniks, Lat W8-M Patrick Mendy, Uk/? Mendy: "I can´t believe what happend, one of the worst robberies in boxing". Well, but Mendy is a difficult man to judge and tend to leave rounds too close. Cederroos won the vacant IBF female 168 lb title on scores of 96-94 twice and 95-95. Cederroos used her superior height and strength well, stuck to the basics and did well. Hermans was the better boxer but seemed to give up on herself late in the fight. br: ref Benni DeCroos, jugdes: J P Van Imschoot, Holger Wiemann, Luigi Zaccardi. Gutierrez won the vacant EBU title on scores of 99-91, 98-92 and 99-92. 80-70 twice and 80-69. Hernandez had points deducted in the first and fifth for headbutts. 78-75 twice and 78-74. The Madrid title was at stake. Tronche retained the French title.